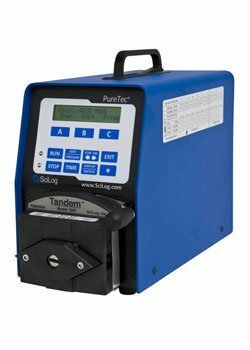 The SciLog PureTec is a tangential flow filtration (TFF system) that monitors and adjusts the trans-membrane pressure to optimize product yield. PureTec® systems are used for protein purification, concentration, diafiltration, as well as harvesting and clarification, and are available with a choice of pump heads and motor speeds suited for your application providing flow-rates up to 2,000 ml/min. The PureTec® system comes with a set of 3 SciPres® pressure sensors, an 8.1 kg balance, a 500 mL vessel with magnetic mixer and a start-up kit including tubing and fittings for your bioprocessing needs. The PureTec® TFF system has automatic documentation and alarm /pump stop settings allowing the user to focus on other tasks while the system is running. Programmable end points ensure the system stops operation when a diafiltration or a user defined concentration is reached. The pump rate or pressure modes of the PureTec® system can be increased or decreased while running without stopping the action of the pump. The SciLog FilterTec™ automated laboratory-scale normal flow filtration (NFF) system can optimize filtration parameters, maximize filter throughput and can be used as a filter evaluation tool. The FilterTec™ connects up to three pressure sensors to automatically monitor, adjust and document pre-filter back pressure and permeate flow rate to optimize filtration speed, maximize filter throughput, and scientifically evaluate or compare different filters. The walk-away system is fully programmable providing peace of mind for the user, whilst they concentrate on other tasks, providing significant cost savings. The FilterTec™ automated normal flow filtration systems increases efficiency in the following applications: media and buffer filtration, bioreactor harvest, final sterile and viral filtration, chromatography column loading and filter evaluation and comparison. 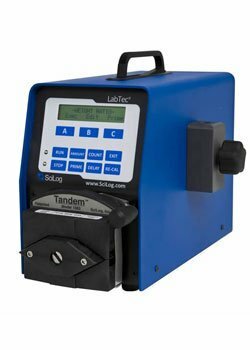 The SciLog® LabTec® automated dispensing system is an easy-to-use, one touch, fluid dispensing system, dispensing by volume, weight or weight ratio. Once the dispense volume is set up, the user simply needs to press a button to initiate the high precision, high accuracy dispense ranging from milliliters to liters. The LabTec® system can also perform in-line filter sterilization when combined with an in-line SciPres® pressure sensor, the system is able to sense filter fouling. LabTec® systems are used in laboratory sample preparation and dilution. Also, often used in small production runs for final fills for vials, bottles, bags and other containers. 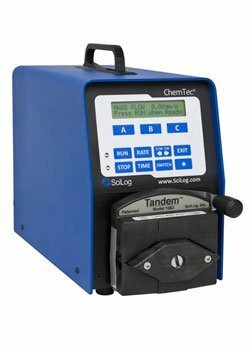 The SciLog ChemTec™ system provides an automated solution for a variety of chemical and biological processes, scaling from Lab to full production. With a choice of pump heads to suit each application including: Peristaltic, Piston, Mag Coupled Gear Driven. 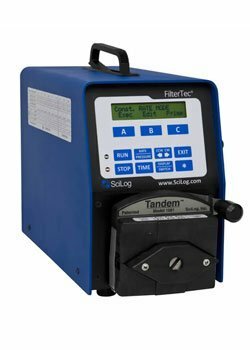 The SciLog ChemTec™ is a fully automated walk away system, which is programmable to auto cut off to avoid over pressure and offers real-time data capture to monitor your process from beginning to end. With no need for additional controllers or monitoring, it helps to ensure your process is simple and cost effective. To further discuss the SciLog single-use pump range, and how we can help you. Please contact us, or request a callback at a convenient time to suit you.